Glasgow Green is home to the People's Palace and Winter Gardens, and has a colourful history since its inception in 1857. The park is currently used for leisure activities and events such as the Gig on the Green, but historically it has seen executions, gang fights and more. Several famous local and national dignitaries are celebrated here by sculptures and memorials, including the Doulton, Collins and James Martin Fountains, the McLellan Arch and the Nelson Monument. 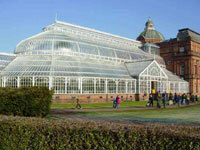 The People's Palace and Winter Gardens are a museum and glasshouse located near Glasgow Green. The People's Palace was opened in 1898 with the aim of providing a centre of culture for the crowded East End of Glasgow. In recent years, the building has been used as a local history museum, with exhibitions on how people used to live in Glasgow, from 1750 to the present. Glasgow Green is within easy walking distance of the city centre, and can also be reached by bus and underground services.